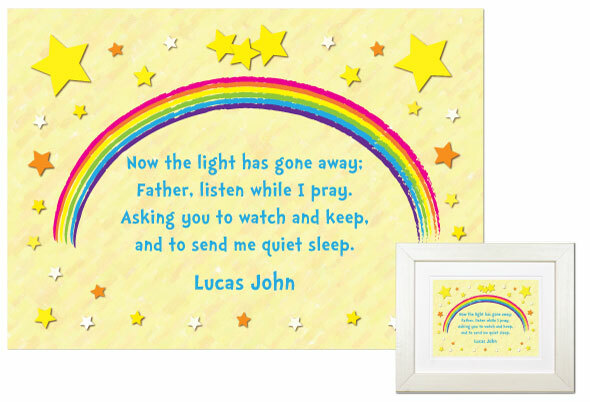 When I was a little girl, a lovely needlepoint bedtime prayer (“Now I Lay Me Down to Sleep”) which my mother made for me hung on the wall above my bed. That piece was the inspiration for the collection of personalized bedtime prayer plaques which we created for The Christian Gift. In fact, the little pajama-clad praying girl and boy who are depicted in the original piece were recreated by artist Kathleen Herold for two of our designs…all these many years later, those two little tykes have reappeared on the scene! We have a variety of designs, and many of them come in a variety of colors. These plaques make great gifts for grandchildren, special family friends – or your own kids. Oh…and if the child who receives it is a little sentimental and hangs on to his or her bedtime prayer like I did, you can be confident that the artwork will still look good years from now. We use premium museum-quality materials so the paper and matboard will not yellow. All you have to do is hang them out of the way of direct sunlight, just as you would with any artwork.